The banking industry's best-selling reference classic is now updated for today's financial services professionals! Bankers have turned to the Encyclopedia of Banking and Finance for over seventy years to get the critical information they need. And for good reason: this handy, authoritative volume contains an exhaustive review of almost any banking-related question that you might face. Not only is the Encyclopedia an excellent problem-solver and trouble-shooter, but you can also use the research and information inside for strategic planning, presentations and reporting. 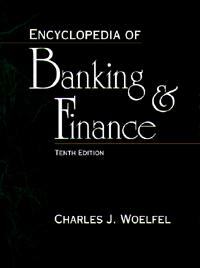 In addition to defining thousands of banking, business and financial terms, the Encyclopedia includes a wide array of useful legal, statistical, analytic and regulatory tools. And the Encyclopedia isn't just for bankers. It's a definitive guide for anyone in the accounting, finance or investment industries as well as students of business. This definitive guide is a cost-effective investment for any banker : from lending to finance to marketing to retail and all the way up to the CEO. The Tenth Edition contains over 4,200 valuable entries, including more than 2,000 new and updated terms.